Short sleeves on a very dressy dress; Delineator, February 1930. Butterick pattern 3032, for [Misses age] 14 to 20. A short sleeved-house dress worn while washing dishes in February 1930. Super Suds soap advertisement. The woman on the left in this picture wears a work uniform with short, set-in sleeves. Left. a servant or waitress uniform, June 1929. Ad from Delineator. The short-sleeved work dress below probably has kimono sleeves — cut in one with the top of the dress and finished with bias tape, like the neckline. This was a fast, cheap way to make a dress by eliminating facings and separate sleeves. Woman ironing with a mangle while wearing a short-sleeved house dress. Ad, June 1929. Delineator. Short kimono sleeves — that is, sleeeves not cut separately from the dress bodice — were very common, and contributed to the ease of making the typical twenties’ dress. Two casual dresses from April, 1929. Butterick 2573, left, and 2541, right. The alternate views are interesting: even in its long-sleeved version, 2573 has kimono sleeves at the shoulder. 2541, on the other hand, has short, set-in sleeves. Alternate views of 2573 and 2541. April 1929. Waists are still low, and lengths are still short. Full length views of Butterick 2573 and 2541. Delineator, April 1929. Perhaps 2541 has set-in sleeves because it was available in very large sizes — up to 52 inch bust. Both Butterick 3028 and 3067 from February 1930 have kimono sleeves, but they reflect the rising waistlines of 1929-1930. 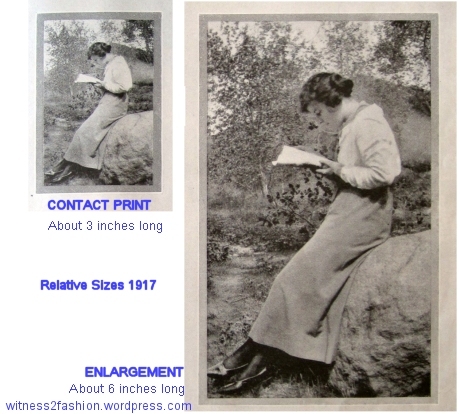 32″ to 44″ bust was the normal Butterick size range, but these models are not youthful. Two typical dresses from the first half of 1929. Butterick 2648 (in sizes up to 48) has set-in sleeves. 2668 has kimono sleeves “for sun-browned arms”. Delineator, June 1929. These short dresses with low waistlines were on the verge of extinction in summer, 1929. Close-fitting wrist-length sleeves, cut and sewn separately from the bodice, were usual for street clothes in the Twenties. 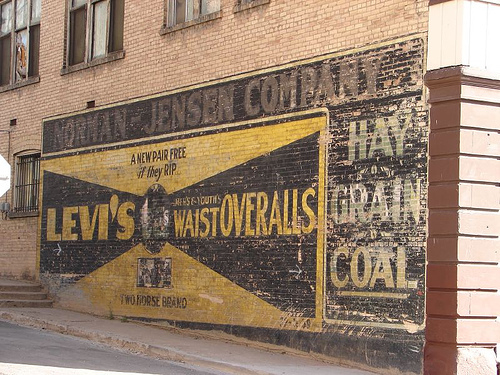 But I notice that the short sleeve, as we know it, was increasingly used on “dressy” dresses in 1929 and 1930. The caption for this page was “Mature Grace.” The sheer dress on the left (Butterick 3168) has the new, short sleeves — and it is suggested for older women in the normal size range. April, 1930. The name “one-quarter sleeve” is useful. Many of the new, shorter sleeves were decorated with a non-functional tie or bow. 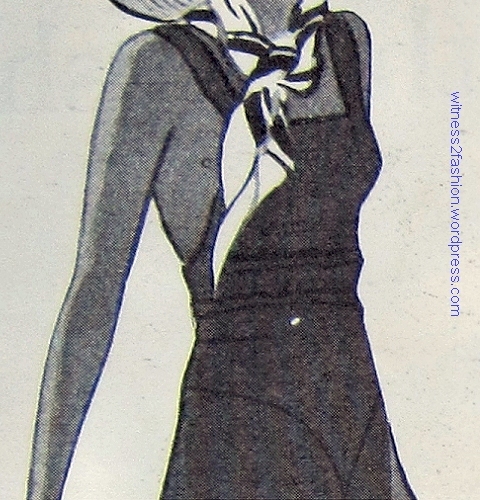 Butterick 3058 from February 1930 has short sleeves trimmed with decorative bows. Right, another bow-trimmed short sleeve, from March 1930. This is definitely not a house dress. Butterick patterns from Delineator. Left, a dress from Saks; right, Butterick blouse pattern 3282. Delineator, June 1930. Notice how long the dress is; both dress and blouse have natural waistlines. Bows on short sleeves were not just a Butterick pattern idea. All four of these dresses from June 1930 have the new short sleeve look, but, incredibly, they all have kimono sleeves — described as the key to an “easy to make” dress. Dresses with short, set-in sleeves. Butterick patterns in Delineator, July 1930. Bows on the sleeves were not obligatory. Butterick patterns for young women, July 1930. Delineator. But they are very “summer of 1930”! A princess line dress with short sleeves trimmed with decorative bows. Butterick 3349 from August 1930. All Butterick patterns pictured are from Delineator magazines. Family photo: Isabel Porter and Dot Barton in car, dated 1919. Isabel is wearing an embroidered dress, but Dot is wearing hiking clothes: knickers and a middy shirt. Imagine how dreary costume history in the 20th century would be without photographs — not just posed studio photographs, but the millions of pictures taken of and by ordinary people. Small, simple to operate, “pocket” cameras really did give us a window into the past. Four teenaged girls from Redwood City, California, pose in a back yard on May 5, 1918. From left, Edith Nicholls, Ruth Cross, Dot and Helen Barton. Edith and Ruth are wearing fashionable dresses; Dot wears her school uniform and Helen adds a sleeveless sweater to hers. I have written before about the importance of informal snapshots during World War I, made possible by the development of small, light-weight, portable “pocket” cameras. Click here for that post. 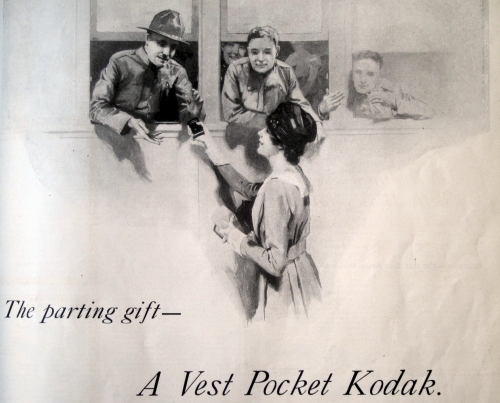 “Snap-shots from Home” enhance morale for soldiers in World War I. Kodak ad, Ladies’ Home Journal, September 1917, p. 91. Soldiers also took photos with the “vest pocket” Kodak and mailed them to the their families and friends. Kodak was also developing innovative cameras for use at home. This 1917 advertisement is for the Kodak Autographic camera, which allowed you to record when and of whom the picture was taken on the negative: a 1917 time stamp! Ad for the “Autographic Kodak”, from Delineator magazine, July 1917. “And to make an authentic, permanent record, on the negative, is a simple and almost instantaneous process with an Autographic Kodak.” 1917. This ad appeared seven years later, but the “family” focus is the same. Ad for the Autographic Kodak from Delineator, May 1924. The Autographic Kodak was still being advertised in 1924, but, sadly, no one in my family seems to have had one — so they wrote on the pictures, sometimes long after they were developed, and not always accurately. The folks in this group photo are named in ink on the margin of the picture. Isabel and Dot visit an Aviation School, dated 1919. Dot in the cockpit and Isabel beside the plane, dated 1920. Was this picture really taken in a different year? Did they take flying lessons? Some women did — quite successfully. Home movies taken with a Cine-Kodak, from an ad in Delineator, March 1927. My Uncle Mel as a teenager, with Ruth Cross. Ruth wears a pinafore. 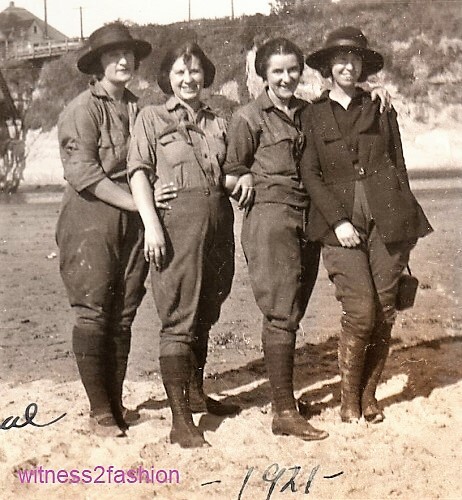 WW I era. How I wish I could watch those family movies today — to see my parents and grandma and aunts and uncles in motion, wearing their ordinary clothes, doing ordinary things…. Family and friends at a party in the early 1930s. I recognize many of these faces, although I was born many years later. The photo is about this small, since it was a contact print. The McLeods pose for a snapshot. The mother is dressed very differently from her daughters. 1920s. Three men pose in La Honda, CA, in the 1920s. Yes, people did wear those golf outfits, [matching sweater and socks!] even when not playing golf. 1920s. 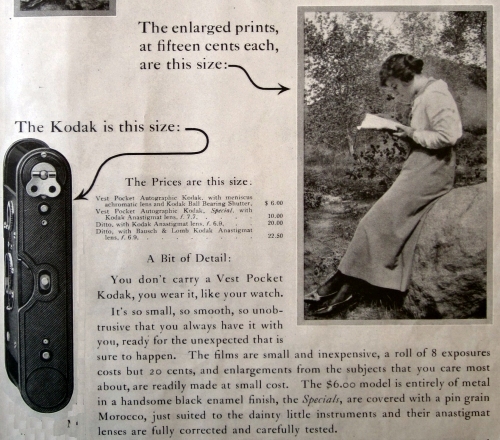 In the late 1920’s, pocket cameras were so common that Kodak advertised them in different colors, to match your outfits. Obviously, women were taking a lot of the pictures that we treasure today. Ad for Vanity Kodaks in colors to match your outfit. Delineator, June 1928. Top of ad for Vanity Kodaks. 1928. “Vanity Kodaks come in five lovely colors [“Redbreast, Bluebird, Cockatoo, Seagull and Jenny Wren”] to harmonize with one’s costume.” 1928 ad. My Aunt Dot took to photography early. You can see her shadow as she takes this photograph of young Azalia Dellamaggiore in front of the Redwood City courthouse in 1918. Here Dot and a soldier are photographed by someone else, but Dot has her camera in her hand.